Nollywood actress, Toyin Abraham has reacted to a comment from a fan who blasted her failed marriage to Adeniyi Johnson. 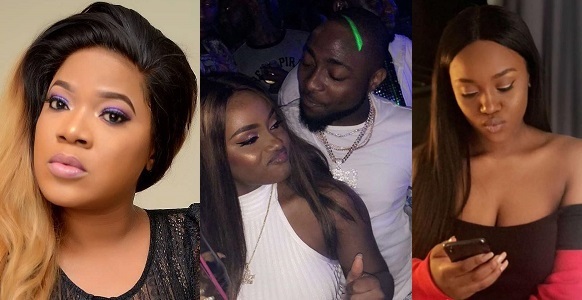 It all started as a result of the video of an interview in which Toyin Abraham is seen speaking on the relationship between Davido and his girlfriend Chioma who have been in the news lately. In the interview, Toyin Abraham says she sees their love as a sweet one but she still consider them as kids who are still growing up. Reacting to the video of the interview on Instagram, a fan lambasted Toyin’s opinion by reminding her that she couldn’t hold down her marriage to Adeniyi Johnson. Perhaps, the fan’s aim is to tell her that she doesn’t have the right to share an opinion concerning relationships. Responding to the fan’s comment, Toyin made a clapback by labeling the fan an imbecile.